We are a contract manufacturer specializing in the research and development of natural, innovative products. 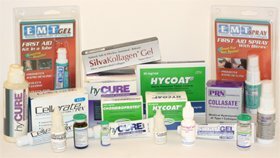 Hymed® utilizes collagen and glycosaminoglycan (GAGs) chemistry for the human and veterinary markets with applications in wound care, joint/tissue support, eye care, surgery, dental, and dermatology. Working with distributors around the country, we partner with doctor's offices, veterinarians, hospitals, and other medical vendors to bring our products to the world. Check Out What Our Customers Our Saying! Sorry to be graphic but this is both a lesson and a way to express gratitude. There was a 25% improvement in one day! This compound works! Thanks, Anita Petito! Last picture of this finger. (on the right) Eleven days out and back to normal. The CellerateRX powder and gel that I used must be alien tech. As a well established dog training and boarding business, we have been highly involved with animal care of all kinds throughout the last 22 years. Two of the most amazing products in our first aid kit and on our "go to" list have been EMT gel and EMT spray. No matter how properly we raise or care for our dogs, they happily crash through life and get dings and dents along their merry way. EMT gel and EMT spray can safely close a wound and promote healing like nothing we've ever encountered before in a first aid product. It's clean, effective and quick in its effect. Since it’s also very easily applied, we can't imagine being without it at our pet resort or in our homes! joint support, our goal is wellness through specialized healing." Using this philosophy as a foundation, The Hymed Group produces wound care products, chondroprotective agents and topicals that stimulate the body's own natural healing abilities. A sister company to The Hymed Group, Applied Nutritionals, manufactures state-of-the-art nutritional supplements with formulas based on collagen and glycosaminoglycan chemistry. Distribution opportunities are available. Applied Nutritionals will develop formulas specific to a company's need through private labeling. Call 610-865-9876 or email an@hymed.com with any questions. Triple patented liquid nutritional supplement for overall body wellness. Contains all the major compounds of connective tissue including hyCURE collagen which supports bone, muscle, joint, skin, hair, and nail health. Aids in cell development and repair. Promotes greater mobility, elasticity, and flexibility of muscles, joints and connective tissue. Promotes comfort by cushioning, lubricating, and hydrating joints. hyCURE supplies 19 amino acids in aiding in energy production. Minimizes bone loss. REVITALIZE YOUR BODY.